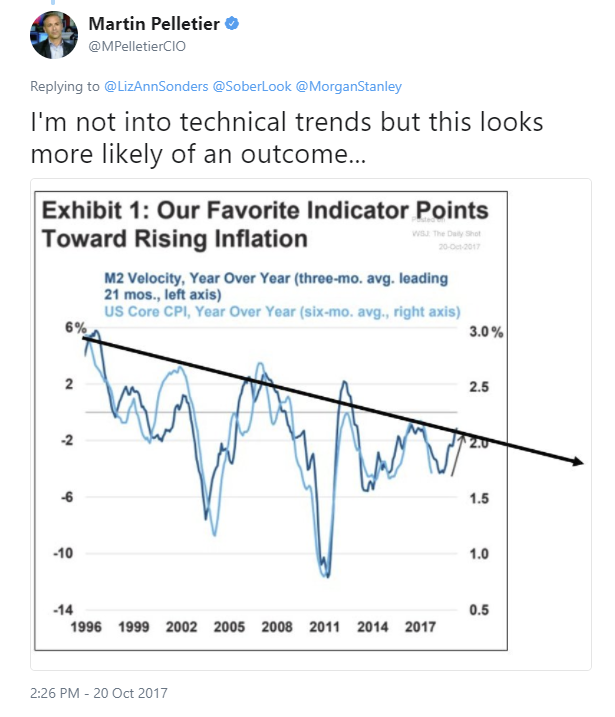 Let's investigate six reasons economists think inflation is about to pick in 2018, and why I think they are dreaming. Minimum wages rise in 18 states starting in 2018. The National Bureau of Economic Research paper: Minimum Wage Increases, Wages, and Low-Wage Employment: Evidence from Seattle, 2017 concludes there was a negative benefit to low wage workers as a result of wage hike. A 9% reduction in hours worked at wages below $19/hour. The findings that total payroll for low-wage jobs declined rather than rose as a consequence of the 2016 minimum wage increase is at odds with most prior studies of minimum wage laws. These differences likely reflect methodological improvements made possible by Washington State’s exceptional individual-level data. When we replicate methods used in previous studies, we produce the same results as previously found. This is an issue that's debated over and over again, mostly with poor methodologies to come to the desired conclusion. In contrast, the NBER had "exceptional individual-level data". Adding support the NBER's conclusion, the Bank of Canada estimates Minimum Wage Hikes Could Cost Canada's Economy 60,000 jobs by 2019. By the way, and as discussed in Staggering Rent Increases in 2017, the median U.S. rental now requires 29% of median monthly income, according to Zillow. Between 1985 and 2000, renters spent about 25.8% of their income on housing. Next, factor in student debt. Finally, note the staggering fact that 24% of millennials are still paying down Christmas purchases from 2016. For details, please see Holiday Shopping: Sticking to a Budget? Even Have One? The proper conclusion is wage hikes are not sufficient to pay down debts let alone to be used chasing the prices of goods and services higher. This is the Phillips Curve thesis. The theory claims there is a historical inverse relationship between rates of unemployment and corresponding rates of inflation. In short, falling unemployment will lead to a rise in inflation. In March of 2017, Janet Yellen commented in a post-FOMC Q&A “The Phillips Curve is Alive“. Also note that Stanley Fischer also mentioned falling unemployment as a determinant for rising inflation. In advance of the 1973-1975 recession, economist Milton Friedman correctly predicted both inflation and unemployment would increase. Wikipedia offers this amusing comment: "In recent years the slope of the Phillips curve appears to have declined and there has been significant questioning of the usefulness of the Phillips curve in predicting inflation. Nonetheless, the Phillips curve remains the primary framework for understanding and forecasting inflation used in central banks." It's rather amazing anyone still has faith in Phillips Curve nonsense. Yet the outgoing Fed Chair, Janet Yellen, and the former Vice-Chair, Stanley Fischer, are believers. At the December meeting, the Fed upped its estimate of GDP growth on the expectation Congress would pass a tax bill. According to the December FOMC Economic Projections, "Most participants indicated that prospective changes in federal tax policy were a factor that led them to boost their projections of real GDP growth over the next couple of years; some participants, however, noted that they had already incorporated at least some effects of future tax cuts in their September projections." John Hussman discusses economic growth in his excellent stock market valuation article Survival Tactics for a Hypervalued Market. "Given that record earnings and depressed corporate borrowing rates have not sufficed to boost net domestic investment beyond half of its historical norm, and prior tax windfalls (e.g. the 2004 repatriation holiday) were almost entirely expended on dividends and stock buybacks, there’s little reason to expect any sort of durable surge in capital spending. That’s particularly true given a 4.1% unemployment rate and already deep account deficits, since rapid growth in capital spending invariably emerges from wholly opposite conditions," states Hussman. "One of the most outrageous fallacies put forward by economists over the past year is that lower US corporate tax rates will cause the repatriation of offshore cash balances. This view, which is widely endorsed by many analysts, fails to reflect the true nature of offshore tax schemes and how problematic it will be to reverse these complex transactions." I suggest reading Whalen's excellent article to understand the numerous complexities involved. The general theory in play is that a falling dollar means rising commodities and higher prices on goods, especially imports. The above chart shows the year-over-year percentage change in the Personal Consumption Expenditures (PCE) price index vs the year-over-year change the US dollar index. This reason I found in a Tweet by LizAnn Sonders. A three month average vs a six month average offset by 21 months seems like a lot of curve fitting. Here is a Tweet Reply by Martin Pelletier that makes sense to me. By the way, let's look at what we are talking about here in actual terms instead of percentage increases. The rationale behind this idea is a rising price of crude portends higher prices, and not just for food and energy. Here is a chart that I created that shows the relationship. There is merit to point number six. Note that even core PCE prices which exclude food and energy are very highly correlated without having to do arbitrary time shifts. However, point six implies the price of crude will climb still higher. Will it? I don't know. Nor does anyone else. However, we can say that at least some of the recent rise is related to tension in Iran. We can also say that Trump is fanning those tensions. On the other hand, the Washington Post reports U.S. crude oil production is flirting with record highs heading into the new year, thanks to the technological nimbleness of shale oil drillers. ZeroHedge reports Russia Boosts 2017 Crude Oil Production To 30-Year High. ZeroHedge also reports New Pipeline Doubles Russian Crude Oil Supply To China. There is no basis for five of the six most popular reasons reasons behind the widespread belief that a big surge in inflation is on the way. Oil might provide a reason, but if the price of oil declines, even core inflation is likely to decline. Somehow we managed to get through all of these points and counterpoints without even addressing the questions: What is inflation? And how do we measure it? The above discussion analyzes things using the Fed's preferred measure of inflation, core Personal Consumption Expenditures (PCE) as a meaningful definition. Problems with the definition are numerous. PCE does not include home prices or asset prices in general. The BLS uses a bizarre measure called Owners Equivalent Rent (OER) to calculate rent increases. Here is the exact question the BLS uses to determine OER: "If someone were to rent your home today, how much do you think it would rent for monthly, unfurnished and without utilities?" OER has the largest weight in the CPI at 24.583%. If the CPI included home prices rather than OER the impact would be 24.583% of the difference between the lines. For example, in November of 2013, instead of reporting year-over-year CPI at 1.24% the BLS would have reported 4.06%. The Fed, Bloomberg Econoday, and countless economic analysts are wondering why QE did not produce inflation. It's right in front of their noses in home prices, in Bitcoin speculation, in demand for covenant lite bonds, and in dramatically understated medical costs. Instead, the Fed believes in the Phillips Curve and thinks Core PCE is an accurate measure. As a direct result of the Fed's total incompetence in understanding inflation, bubbles are readily apparent in equities, in junk bonds, and in Bitcoin speculation. ​The BIS did a historical study and found routine price deflation was not any problem at all. ​“*Deflation may actually boost output. Lower prices increase real incomes and wealth. And they may also make export goods more competitive*,” stated the study. ​For a discussion of the BIS study, please see Historical Perspective on CPI Deflations: How Damaging are They? ​CPI or PCE deflation is not to be feared. More precisely, price deflation is a benefit. Falling prices increase purchasing power by definition and thus raise standards of living. 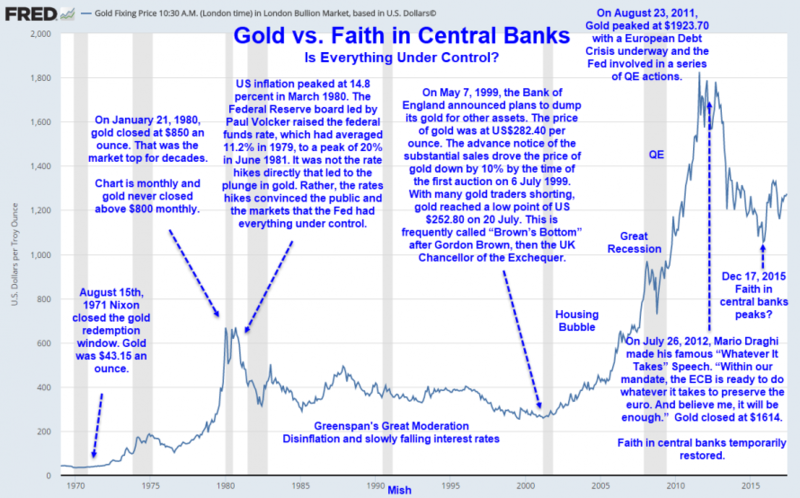 ​It’s asset bubble deflation that is damaging. When asset bubbles burst, debt deflation results. ​Central banks’ seriously misguided attempts to defeat routine consumer price deflation is what fuels the destructive asset bubbles that eventually collapse. If you one single compelling reason that inflation (as defined by the Fed and the academic illiterates) is not about to soar in 2018, here it is: a massive debt overhang. For discussion, please consider Lacy Hunt on the Unintended Consequences of Federal Reserve Policies. Another debt-deflation bubble bursting episode is coming up. All it takes is an economic slowdown or a change in attitudes of greater fools willing to chase the market higher and higher. Conventional wisdom says we need more inflation to deflate away the value of of debt on the books. As of November 30, 2017, Treasury Direct reported public debt as $20.59 trillion. That includes $5.67 trillion in debt we owe to ourselves (think Social Security). At higher rates of inflation, interest on the national debt would soar. Boston Fed President Eric Rosengren believes an Inflation Goal of 2% is Too Low. San Francisco John Williams has stated that the Fed's 2 percent inflation target requires some rethinking, and likely needs to be higher. What a hoot! Despite massive amounts of QE the Fed could not hits its inflation target using its own measure of inflation as a definition. 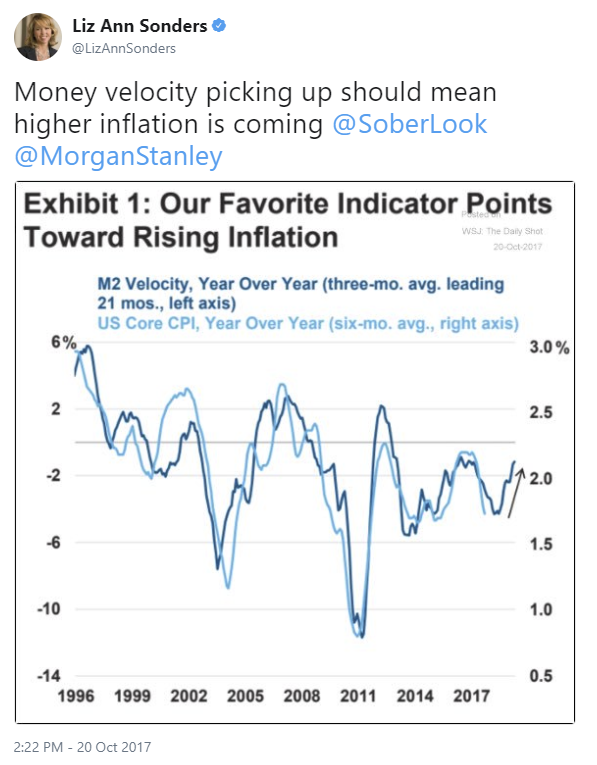 Somehow they magically believe that setting a higher target will in and ofitself cause inflation. Imagine what 6% mortgages would do to home price affordability. Throw conventional wisdom in the ash can. In practice, the more debt and leverage the Fed stuffs into the system, the lower interest rates must be to support that level of debt. We are close to the end of this inflationary cycle just as the average analyst thinks inflation is about to pick up. The Fed might even buy into the notion of rising inflation, especially if crude does spike in early 2018. Then economists will accuse the Fed of "hiking too much" when the fact of the matter is the Fed once again held interest rates too low, too long, in a foolish attempt to cram more debt into a system literally choking on debt. Another round of debt deflation. a currency crisis, or both is in the cards. Timing is the only issue. It's far too late to believe anything reasonable can be done about the mess the Fed has created. Do yourself a favor, buy gold. It's a strong favorite to soar when faith in central banks comes into question.